Having trouble thinking of a way to introduce or promote your brand? Why not make use of creative marketing materials such as half–circle business cards? Get that creative look with a half-circle shape. These customizable cards are uniquely-shaped which will give your business cards a fun, stylish, and fresh look. Compared to ordinary business cards, these custom-cut cards will really stand out. With their 2” x 3.5” size, both horizontal and vertical orientations are options. Half-circle business cards are popular for personal use as well as for standard corporate stationery. They’re also in-demand with health-related businesses. At UPrinting, you can have your cards printed on the front only (with a blank back), or print on the front and back. These are printed in a 14 pt. 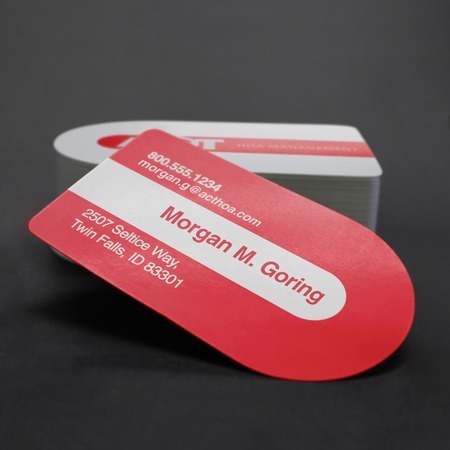 cardstock with the option of gloss, matte or high gloss coatings. Quantities range from 25 to 10,000 prints. Printing turnaround can be 2, 4, or 6 business days. You can also take advantage of our free proofing service before paying, to make sure that your half-circle business cards are printed without any errors.